Our museum shop sales have been reasonable with torches, postcards and second-hand books being best sellers. Books and Journals have also been selling well with our own publications of Sawmills, Dairy and Mt George the most popular. The workroom volunteers are making up memory boxes containing a variety of deaccessioned items. These boxes will be borrowed by nursing homes for activity programs to assist residents with the sharing of memories and cognitive stimulation. 250 including overseas visitors from UK and Canada. 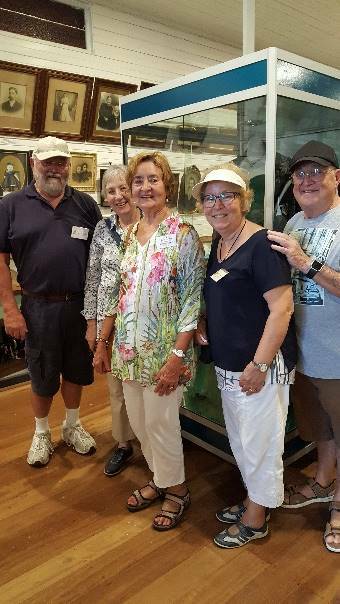 Pictured are Killcare Heights Garden Club members from the Central Coast who have been touring the area and visiting George Hoad’s garden at Killabakh. It’s been a couple of busy months in the museum for the Maintenance and Display teams. 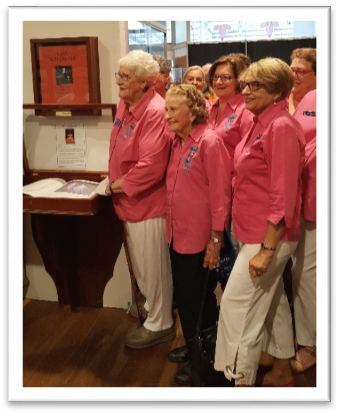 On March 21st, the museum hosted members of Quota International, Taree and MVHS members and guests at the launch of a new display ‘Joan Sutherland – Designs for a Diva’. The display features a limited-edition book of design sketches of Joan Sutherland’s costumes. Jeanette Holland with Quota members beside the display. Launch of Stage 1 of the War Cabinet Area. When: Tuesday April 17th, 10.30am, Museum display launch followed by morning tea. An invitation is extended to all MVHS members and guests to attend. As noted in the March Newsletter we received funding for the refurbishment of the War memorabilia display in our museum. Stage 1, which is a Theatres of War Timeline, will be launched prior to ANZAC Day. For this event, we will host David Gillespie, Federal MP, Stephen Bromhead, State MP and Members of the RSL Wingham Sub- Branch. Stage 2 will be a memorial to All Who Have Served and will be completed later in the year and launched in October. These displays are the Society’s contribution to the Centenary Commemorations of the First World War. Margaret Clark with her research project. 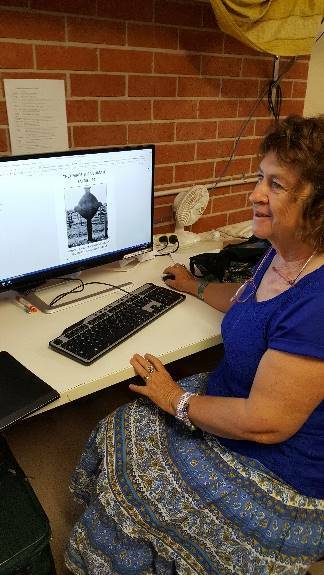 Margaret Clark has been researching and compiling a full list of Manning Valley men who enlisted and served in WW1. Part of the research has involved interviewing and collecting information from families, locating burial sites, finding references, photos and letters. These histories will be compiled into a booklet. Recently Margaret received an email from Todd Wiseman of Wingham, stating that his son, Galen, who is a member of the Australian Airforce Cadet detachment, will be heading to France and Belgium, towards the end of April. The group will be taking part in the ANZAC Day service at the Australian War Memorial, at Villiers-Bretonneux, to mark the 100th anniversary of the battle. Galen, who is a cadet sergeant with 317SQN (city of Taree) Australian Airforce Cadets, will be one of 17 cadets from across Australia at this important event. As part of this visit to Europe, the detachment of cadets will be visiting sites of major battles that occurred in France and Belgium during WW1. Todd’s letter to Margaret was to request details of WW1 servicemen buried in the areas to be visited by the cadet detachment. They plan to visit some of these resting places and pay their respects. Fenlan Miller, a recent visitor to our museum. Fenlan is a young man, 16 years old, from Mudgeeraba, Qld. who is one of 8 students awarded the Qld Premiers prize for an ANZAC grant project for youth, to travel to the Western Front and personally take part in the WW1 100th Anniversary commemorations. The criteria for the student research project was to write about a soldier their own age, a relative who participated in WW1 or a local from their own town. Through research for someone his own age, Fenlan discovered John ‘Jack’ Lancelot Andrews and his father drove him to Wingham to visit the museum to further his research on his chosen subject. At MVHS we have an extensive Andrews archival collection of letters, postcards, photographs of Jack, official death documents, witness statements and letters of condolence, and other family documents and memorabilia (donated by a relative, Dr Adrienne Redpath, Nov. 2014). A museum display features private John ‘Jack’ Andrews who was born at Charity Creek on 26th January 1901 and died 26th September 1917, Polygon Wood, Flanders. At aged 15, Jack joined the Australian Army at Victoria Barracks on 29th December 1916. He gave his age as 19 and forged a letter from his mother giving him permission to join the army. A Red Cross report on his death from an informant, states, … He was in the Lewis gun section … on the 26th September at Ypres Front, in the first line, holding it after advance, a shell burst and blew up 13 men in the trench. After the bombardment, which lasted 3 hours, we collected the dead. I took the pay-book from Andrews’ body and gave it to the sergeant. Afterwards I helped bury the men in a grave. His age at his death was 16 years and 8 months. On behalf of my son Fenlan and myself, I would like to thank you so much for the hospitality, time and expertise extended to us today during our visit by yourself, Terry and the rest of your team. 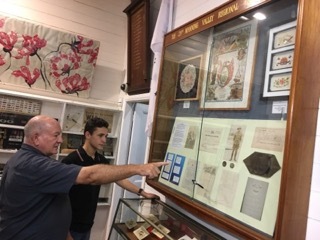 The fact that you have created such a touching tribute to young Jack Lancelot Andrews is a testimony to the great value of museums such as yours to preserve these stories and perpetuate the memory of the tragedy and sacrifices made by towns like yours all over Australia. Hopefully modern Australians can learn from these reminders. Your museum is also one that balances genuine local heart and soul with creatively displayed artefacts with such professional story telling. 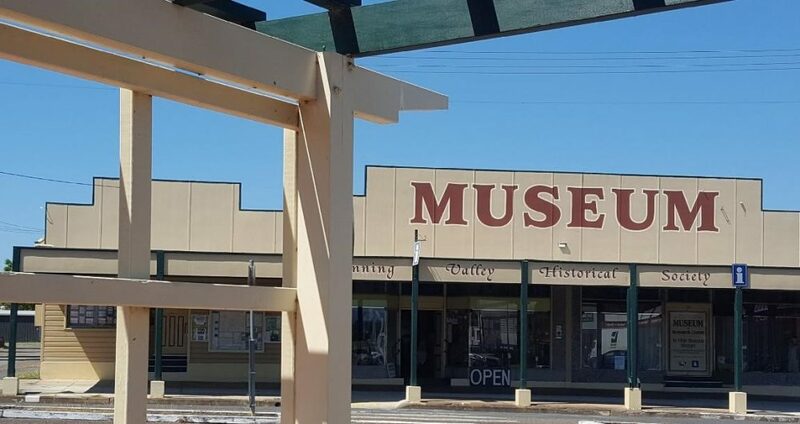 It’s a rare combo, as all too often you see some aspects in isolation at regional museums, but rarely all. It’s a credit to your organisation, curators and team. 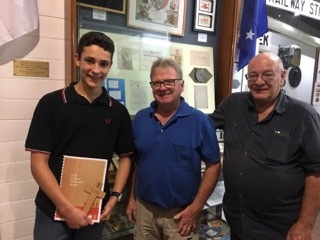 Fenlan has the privilege of travelling to the Western Front as part of his 2018 Premiers prize- http:education.qid.gov.au/students/grants/scholarships/anzac/1018.html – for youth to personally take part in the 100th Anniversary commemorations, but he represents the passion and dedication of those like yourselves that have helped preserve the stories and the history for him to tap into as he has today. Without that, such continuity could not exist. Young Jack Andrews’s story resonated strongly with him, and he chose him as one of the soldiers he wanted to research, how lucky he was that a museum like yours has created the further opportunity for him and others to dig far deeper, and so much more personally. The commemorative stone and the powerful personal insights that he has taken away today will now go to the final resting place of this young Australian soldier from your town on the other side of the world. Thanks so much and we’ll keep you updated when we get pics from his trip.